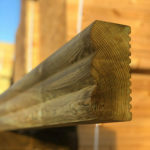 At A&P Fencing we can supply you with the increasingly popular new railway sleepers. Garden sleepers can be used for a variety of projects, including retaining walls, edging and raised beds. The new sleeper is pressure treated during manufacturing to ensure that it stays in top condition for as long as possible. This treatment also gives it a green tint which gives it a gorgeous look in any garden. 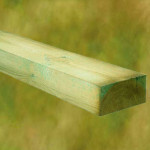 We have a range of sleepers, all listed below. They are available for fast delivery from our West Midlands depots to popular locations including Birmingham, Sutton Coldfield, Great Barr, Tamworth, Lichfield and more.